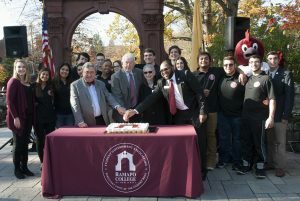 MAHWAH, N.J. – Ramapo College of New Jersey celebrated its 48th birthday during a celebration of Founders’ Day on Wednesday, November 8 at the historic Havemeyer Arch and in the campus Grove. The event was sponsored by the Student Government Association and the Office of the President. “I’d like to thank the Student Government for its enthusiastic support,” said President Peter P. Mercer, who also acknowledged several of the founding faculty members who are still with the College: Paul Elovitz (Associate Professor of History, Psychohistory and Interdisciplinary Studies); Michael Fluhr (Associate Professor of Politics and Social Processes) and Edward Saiff (Interim Dean, School of Theoretical and Applied Science). Also in attendance was Board of Trustees Chair William F. Dator, who also has been actively involved with the College since its founding. The event coincided with the first-ever Day of Giving, an initiative to help provide countless student scholarships, fund faculty-student research and support special College projects. Faculty, staff and students enjoyed a delightful lunch buffet and refreshments and festivities included a photo booth, music, a caricaturist and a t-shirt tie-dying table. Pictured cutting the cake are: President Mercer, Board of Trustees Chair William F. Dator, Trustee Susan Vallario, SGA President Stephan Lally and students from the SGA.